This event is a rare opportunity to run the Nicklaus designed Mountain course and expereience all that Bear Mountain Resort has to offer. The Start Line is located at the end of Hedgestone Lane. Approximately 400m from the Westin Hotel. 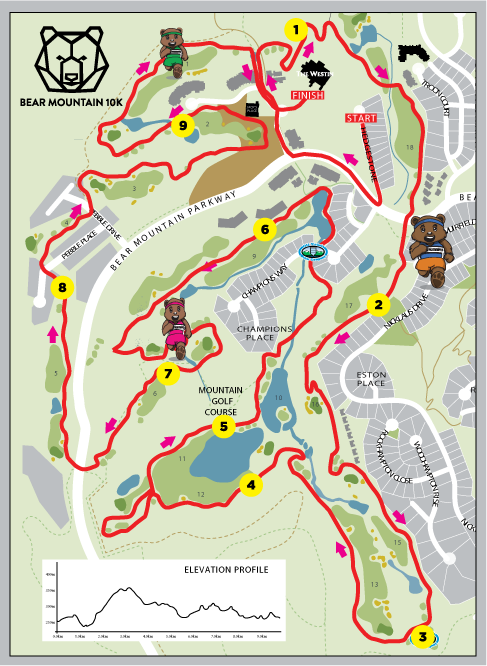 The Finish Line is located directly in front of the Westin Bear Mountain Hotel. There is tons of free parking available for all participants. We will have parking volunteers directing you to available parking spots. Car pooling is always encouraged to reduce our carbon footprint.